The Horatian dictum poeta nascitur non fit wants to be reversed in the case of Chaucer. He was not a born poet, but a fabricated one, whose literary-historical place as the father of English poetry resulted less from talent or vision or any intrinsic merits of his verse born of either, but of his particular social location, doing his particular jobs at the time and place, this social location investing his verse with perspectives and attitudes and values that made the verse amenable to bearing the historical weight it has had and retains.1 Chaucer has been a useful poet, rather than a good one, because he could serve. 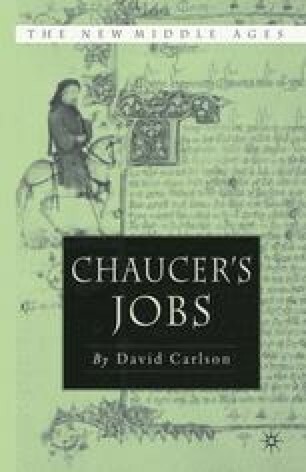 Immediately, the writings themselves served the same interests Chaucer worked for in his household and state-bureaucratic employments; Chaucer’s writings also served other writers, contemporaries and after-comers, as a useful model for what poetry and poetic success might be.